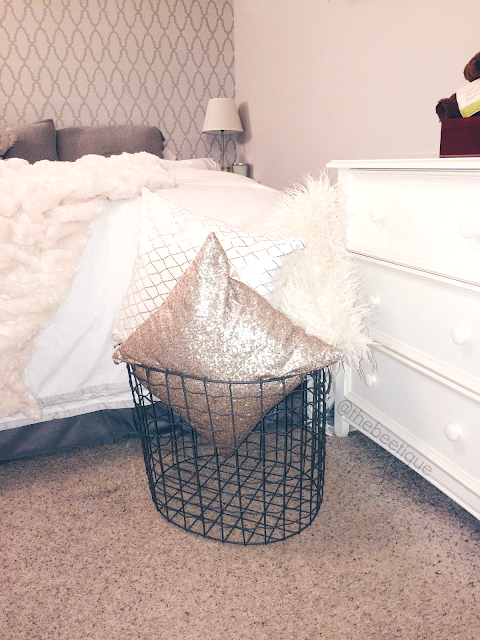 Okay, so you want to redo your bedroom, switch up your bedding, or maybe just want to jazz up your couch. You won't settle for a bed-in-a-bag because the throw pillows are too chintzy looking, so you go to HomeGoods to check out the throw pillow aisle. Looks like heaven on earth, until you look at the price tag of one pillow and come to the conclusion that HomeGoods isn't as affordable as you thought. I beat the system - but don't be mad, because I'm going to tell you how I did it. I always thought that the concept of throw pillows were strange, primarily because they're always sold separately. It's likely that you probably want two of the same -- one for each end of the couch, or one for each side. This is nearly impossible to find. Mind you, if you do get lucky and find 2, it'll run you $15-50 PER PILLOW. WHICH IS CRAZY. Because you obviously need, like, 3-6 of them. Am I righttttt?? The first thing I did after graduating from college was start a serious bedroom makeover at my parents house. I was going for a minimal, white and 'airy' type look. After falling in love with a white 8-piece fluffy "hotel" comforter set, I felt a little guilty that I'd probably end up using only 3 of the pieces. I was on a serious hunt for the most fabulous sequin, fur, gaudy-looking pillows in the game. On the cheap. Well that was impossible. So I looked on Amazon, and found so many for under $10. After reading deeper into each description (international Amazon listings can be a bit sketchy sometimes) I realized I was actually looking at throw pillow CASES and COVERS. Light bulb. I measured all of my old, square pillow cases and ended up purchasing covers for each of them. I had myself brand new throw pillows for 1/3 of the price. So next time you redo your room or plan on decorating your new place, I encourage you to transform something old into something new. Don't have any existing throw pillows waiting to be covered? No worries -- you can shop the inserts here. Don't forget to measure your existing pillows before choosing the correct size to order! PS - I don't ALWAYS make my bed. And when I don't, I display my throw pillows here. 8 comments on "Never Buy Another Throw Pillow Again"
What company makes that bedding set you posted? Hotel Collection, discounted from Marshall's! They also sell Hotel Collection in department stores such as Macy's. Love it so much. I love the wall color. I noticed in your stencil post that you used Silver cloud as the light color for the stencil. Did you also use it as the ceiling color and for the other walls? If not, what colors did you use? Hi there! 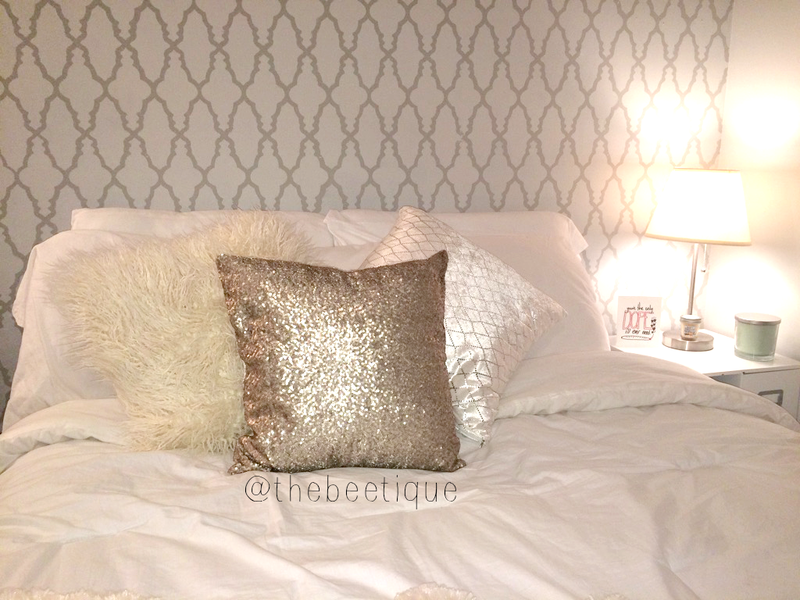 Yes, I used Silver Cloud to paint the other 3 walls in my bedroom. I love the idea of "marshmallow" grey walls instead of plain white. I painted the ceiling, door and molding a flat WHITE - I think it looks awesome this way! Do you mean you cut down old pillows? What you said doesnt make sense you measured old pillow CASES and ordered more cases? You covered cases with covers? The pillow itself is the pricey part, not the cover. Im so confused.